Yes, Adeline’s Sea Moose hosts private historical tours! Architecture tours are a wonderful introduction to our beautiful city. Learn everything there is to know about Chicago’s unique and colorful past while interacting personally with one of our amazing docents. Interested in certain subjects more than others? Let us know and we will work to create the perfect package for you and your group. Chicago is not the only place with history! 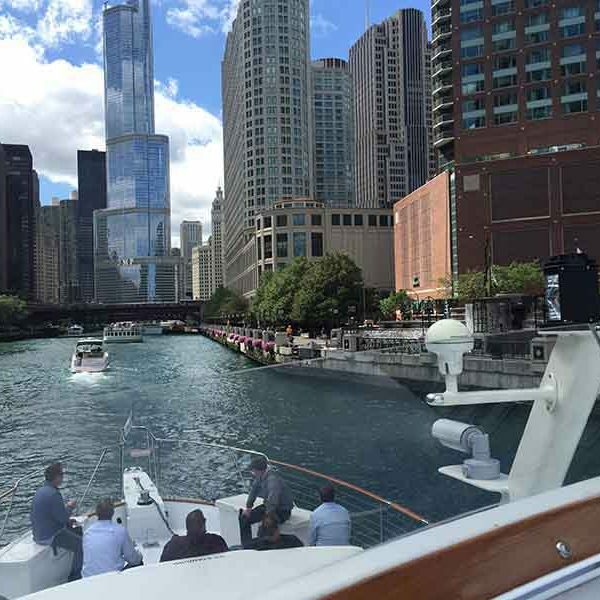 Chicago Private Yacht Rentals has teamed up with History enthusiasts and docents to create fun and informational destination charters! These specialty charters can be personalized to fit clients dreams and are great for employee appreciation events, client ‘thank-you’ events, bachelorette parties, birthday celebrations, family reunions and more! Content may include prohibition, gambling, crime, industrialization, the dunes, historical information about our midwest landscape, Lake Michigan, Chicago and more! Private Architectural River Tour’s aboard Adeline’s Sea Moose are truly stunning! Unlike other river tours that often feel like glorified shuttle busses, Adeline’s Sea Moose provides luxury lounging areas on multiple decks with two separate lounge areas. With surround sound both in and outdoors you can relax and hear our docents from anywhere on the yacht. 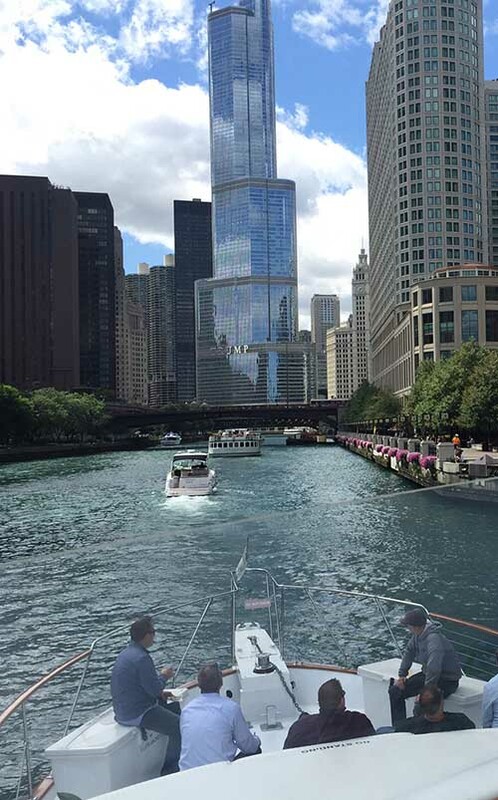 Our Docents do a phenomenal job unpacking Chicago’s architectural climb into present day as we float though our rivers intricate lock and levy system. Keep in mind charters aboard Adeline can be tailor-made to incorporate clients unique interests! Don’t miss out on an amazing opportunity! Uninterested in the River? 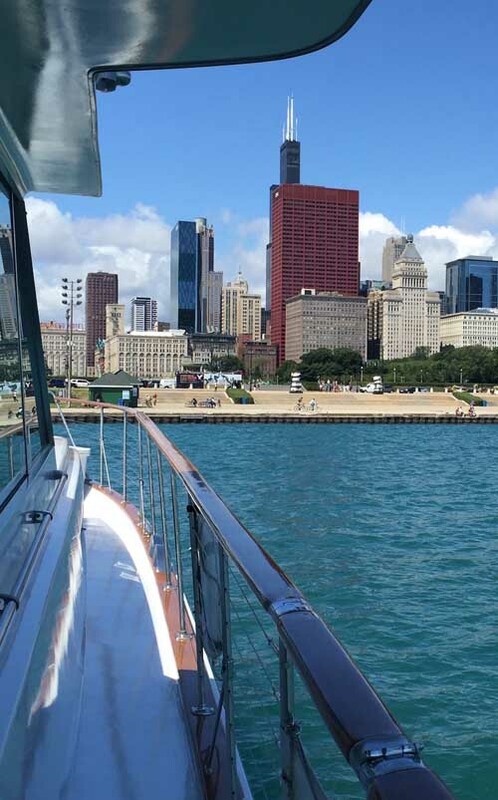 Views aboard Adeline’s Sea Moose will show you why Chicago is affectionately nicknamed ‘The Jewel of the Midwest’. Our docents accompany views with fun and interesting information about the growth of Chicago how it came to be the city you see today. Highlights include but are not limited to The great Chicago Fire, Chicago’s Water Filtration System, Queens Landing, Buckingham Fountain, Navy pier, The World’s Fair, the architects behind Chicago’s urban planning and much, much more!